Oracle R12. What is the Usage and Purpose of the Customer Taxpayer Id for eBTax? Per R12 design the operating unit and legal entity do not hold one-to-one relationship anymore, which is in sharp contrast to 11i. Now one operating unit can be attached to many legal entities in a ledger. Under General Ledger (GL) responsibility, Setup : Financials : Accounting Setup Manager, all the legal entities of a primary ledger or secondary ledger can be found. Here, customer refers to the Apps deploying agency that is liable to pay a supplier invoice and is accountable to legal authorities for it. So once the “customer taxpayer id” is selected at the header then the system doesn’t default legal entity on the basis of “bill to location” of the selected supplier site and the invoice liability account. The “customer taxpayer id” gives a way to explicitly override the default legal entity derived from supplier site and liability account and default org id. “Customer taxpayer id” is the unique reg. number used to identify an LE. Also “Customer Taxpayer ID” can be used for any type of invoices. The system does not consider it to be mandatory. In summary, the customer taxpayer id is used to explicitly override the default legal entity derived from supplier site. On the contrary, the taxpayer id is used to enter tax information about the individual or legal entity, which can be a corporation or a partnership. How does this affect ebtax? You can link the tax regime to either the OU or the LE and therefore use this as the way for driving the tax for your AP transaction. Ideally, you will have a solutoin where there is only one LE linked to your OU and in this case youc an only ever choose one value for the customer tax payer ID so you would never have to choose it as it will be the default. But if you do have more than one LE linked to your OU then you can only determine the place of supply for the tax regime rules with the bill to or ship to. As there could be multiple ship to values then it the only other approach is to change the bill to and to do this you need to change the legal entity (customer tax payer ID). Useful Excel Macros for eBTax. The following is particularly useful when you are trying to format the Financials Tax Register. If you have the Financials Tax Register in Excel, you can remove any column which has no entries with this macro. When setting up Receivables Activities and you need to associate a tax rate to the ‘Asset Tax Rate Code’ or the Liability Tax Rate Code’ but the tax rate you’re looking for is not visible then it is probably because you have set up the tax rate but not associated any tax account or not associated a tax account that is linked to the same ledger used by the operating unit that the receivables activity is linked to. To resolve the issue, you must add the tax account under the same ledger. By default, when selling to a registered EU supplier, I will either set the tax solution to calculate an EU Sales Goods, EU Sales services or an EU Sales Triangulation tax rate – all with a 0% rate but often with different parameters to allow me to report them differently. On the flip side, when receiving an invoice from a supplier, i would only split between the purchases from Europe of goods and services. But a client of mine recently has insisted that for invoices received from suppliers they need to record separately the tax rate when the supplier charged triangulation tax. Is this the norm? is this a legal requirement? what countries would need this if it were a legal requirement as my client is located in Spain. Need a quick US Sales and Use tax solution in Oracle but don’t want to pay the large sums for a 3rd party solution? There are several 3rd party providers out there such as Taxware, Sabrix (One Source), Vertex who provide an indirect tax solution, primarily for the US Sales and Use market but also for other countries. I have never not been able to meet the needs of any of my clients for any GST/VAT based solution and Oracle can easily handle the tax requirements so I would never suggest to my clients that they should use a 3rd party provider for their non-US tax solution. However, when it comes to the US, there is a clear advantage to using a 3rd party provider. Tax reporting codes – how to find them? Oracle provide tax reporting type codes that you can assign to the tax rate, the status, the process result, pretty much anywhere but once the tax has been calculated, how on earth do we find out what tax reporting codes have been assigned or not? 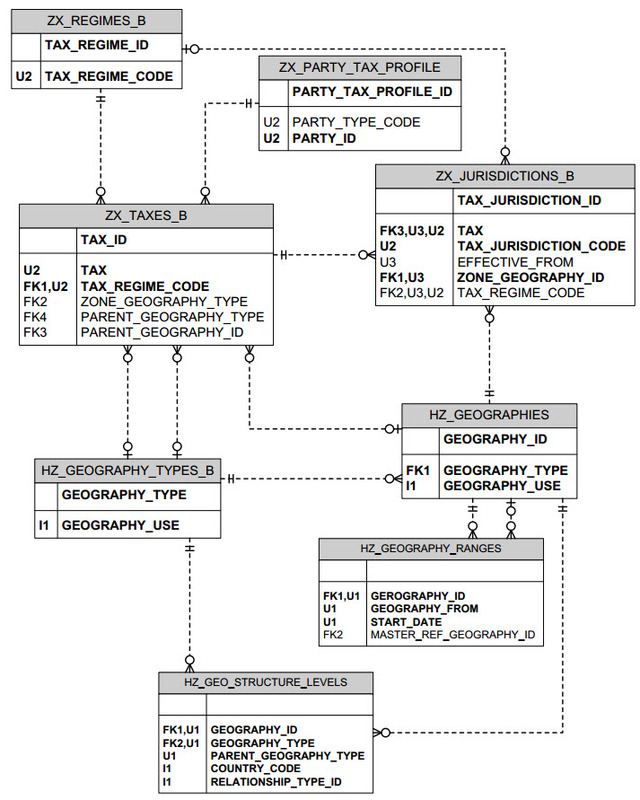 Below is an example of a Tax Reporting Type that we have created with the codes. Below are 2 scripts, the first one is to find the tax reporting type code assigned tot he process result (when a tax rule has selected a tax status) and the second one that is linked to the tax rate itself. If you’re creating a custom process or using this information in a report then i would suggest that you check the process result first before checking the value linked to the tax rate. Apologies for the poor SQL but I am more of a functional consultant rather than technical. These scripts will list all the tax reporting codes linked to the transaction. When setting up and VAT or GST based tax, I would advise that a tax rate is always calculated, so even when the tax is not known, use a tax rate call ‘tax not known’ for example. This way, you will have a tax rate on every transaction, if one is not there then you know there has been an error rather than not knowing if the system has calculated the tax correctly or not! Secondly, if you don’t calculate a tax rate then you cannot report it. Having a tax rate on every transaction means that your tax reports will also have every transaction on them making the reporting thorough and reconciliation easier. Of course there will be times when you won’t need a tax, on prepayments for example or if you create internal transactions that are just used for internal use and no tax is required, but if its for a sale or purchase, then have a tax rate. The US Sales and Use eBTax solution is a jurisdictional based solution and many of the exemptions are handled by item exceptions or customer exemptions. But a VAT or GST based eBTax solution is a rules based solution and instead of using exemptions and exceptions, rules should be used to handle any exemptions.If we use rules, we can easily determine a tax rate such as ‘NO TAX’ or ‘OUT OF SCOPE’ where no tax is needed but with the US, the exemptions and exceptions either remove the tax line completely or reduce the tax amount to zero. Neither of these ways make it easy to identify that the right tax was calculated or not. So, should we also look at using rules for the exemptions and exceptions in a US tax solution and calcualte a rate of NO TAX instead of the current way exemptions are handled? If anyone says that European vat is harmonised, then they are wrong! Whilst those countries in the euro zone adhere to similar principles with the core tax rules being the same, most European countries will have specific tax legislation of their own, often required purely for statistical reporting but nearly always forming part of the countries localisation requirements. And depending on the client, you may also be required to defer you VAT too. In my opinion, the tax solution should be designed around how you need to report the tax. It is a lot easier to recorded at source the fact that your vat is linked to an asset and report it separately as you can easily add it to the standard rate amounts for the vat submission. But if you had not done this then at the end of the years, you will have to find a way to go through all your transactions for asset purchases and then try and work out an amount which is going to take a lot longer to do that reporting it correctly first time. Oracle themselves may argue that tax reporting codes should be used and I would agree but for the fact that the reporting codes are not visible anywhere in reports or when the transaction has been calculated so how then will the user know that a tax rate is actually a service item or an asset purchase unless we have an individual tax rate for the purpose? There is also another common situation I. France where a French company exports a lot more of its product than selling locally but purchases the raw materials locally. In this situation, the suppliers would be charging vat for our French company to recover but because they are exporting, do VAT is being generated. In this situation, known as ‘Non-Dom’, an exemption certificate is often sought and then provided to the suppliers to stop the VAT from being levied. I would advise against using a tax exception, commonly adopted by a US tax solution and instead manage your exemptions by tax rules. To do this, create a party classification code (Exempt) via the trading community manager and then associate this classification with your FR VAT tax regime for France. Assign the ‘Exempt’ party classification code to your supplier or even better if you want all your supplier to be exempt, assign the party classification code to the legal entity establishment that is making the purchase. Create a tax rule that calls either the EXEMPT OR NON-DOM tax rate for these domestic purchases. If anyone has any other French vat requirements that they would like to share, please add as a comment. Used in Oracle eBTax Tax reporting etc. Oracle eBTax – How to handle bonded warehouses? There are many things that the Oracle e-Business Tax module cannot do and one of those is to handle product that is located in a warehouse that is holding product that is not customs cleared, also know as ‘Bonded’. So what is the best way to be able to let the tax engine know that the item you’re selling is in fact in a bonded state and thus if sold in that state is not subject to VAT. Currently my solution is to use an attribute flag (captured as a DFF) as a a way of indicating that either the locator or the sub-inventory is holding bonded product and then at the time the order is created to trigger an even to allow this information to be used to calculate the tax. Has anyone had this situation before as I would be interested to hear of your solutions or indeed issues. I think what should also go hand in hand with the tax solution is a way to leverage the workflow so that when any product is being either sold directly from the bonded state or is being moved from the bonded to a custom cleared state should be put on hold until the appropriate paper work has been processed by the customs officials. Selling product that is assumed to have cleared customs but has otherwise not been can lead to very big fines indeed.